Two hundred years ago, an English businessman waited nervously at Dover, about to take a leap into the unknown. In July 1817, at the age of 31, Joseph Jackson Lister – a wine merchant and, in his spare time, a researcher in optics and microscopy – was about to travel to Europe. In 1817 Europe was recovering from a generation of war: the defeat of Napoleon at Waterloo in June 1815 had ended over twenty years of war in which the European powers, in shifting coalitions, had responded to the Revolution in France. In Vienna, a Congress of the victorious powers had set out arrangements for Europe that would endure, broadly, for a century – though nobody at the time could have foreseen such stability. And for the first time in a generation, British people could travel easily on the Continent. In the way that Western tourists discovered Prague or Budapest in the early 1990s, British people headed across the Channel to explore the sights that previously only their parents’ generation had seen. Lister was one of these: after leaving Dover, he would explore France and Switzerland, returning through Germany and the Low Countries. Ten weeks would pass before he saw the White Cliffs of Dover again. Lister wrote up his experiences in a journal, now digitised and held in the Wellcome Library as MS.6962. In a little red notebook, fastened shut with a clip, he began a neat, detailed account of his journey. His training as a microscopist shows: he is capable of careful, precise observation which is then recorded in a small, neat hand and, crucially, illustrated with detailed, precise and sometimes coloured drawings. 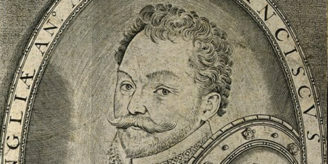 Considerable work was involved: it is clear that he took notes first and made rough sketches, which were then written up into neat prose or turned into precise drawings, sometimes coloured with watercolour washes, and he may well also have created the text first as pencil jottings that were then written up more neatly in ink. We know this because later in the book the process breaks down and pages are filled with scribbled pencil notes, interspersed with sketches and every now and again a finished watercolour. 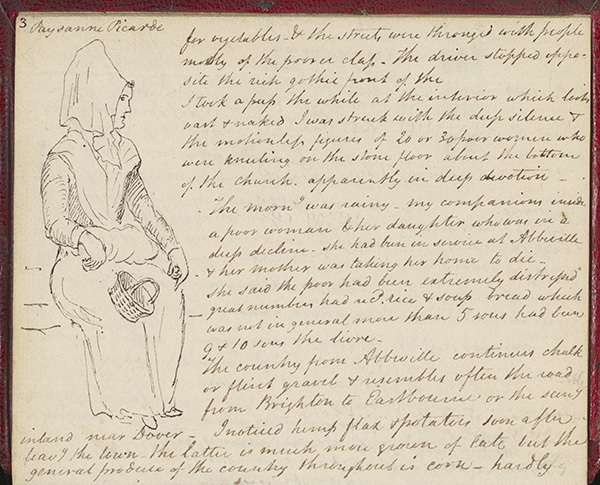 Notes and a sketch of a peasant woman, from Lister’s account of his first travels in Northern France. Lister’s first afternoon in Calais is dominated by administrative matters: his baggage is searched, he is “stroked down without ceremony by the officers of the Douane”, and at his hotel he grapples with the need to order food in a foreign language. 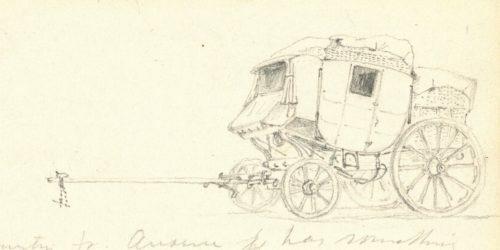 On the next day, however, he is off in a Diligence – the large horse-drawn coaches that were the staple means of travel on French roads at the time. “Company all British or americans. I rode on a comfortable stuffed leather seat behind with the conductor, a stout good-natured Frenchman…” On the way, he peers from side to side, noting every feature of this new foreign environment: the geology exposed on the roadsides, the fortified towns, the goods for sale in the markets, the passengers who leave and join (including some British soldiers who are part of the army of occupation), and, at Boulogne, the site from which Napoleon had planned to launch a flotilla for the invasion of Britain. At Abbeville, he peeps into the vast church and is struck by the “deep silence & the motionless figures of 20 or 30 poor women who were kneeling on the stone floor”: Lister was a Quaker, and this large Roman Catholic church would have been something quite outside his experience. In contrast with this solemn and quiet scene, when he reaches Eu he is struck by the market place “full of people principally women who seemed all to be speaking at once disputing what was to be the price of corn … a singular scene of confusion.” The women’s clothes are duly described and sketched. A view of Rouen, from the journal of Joseph Jackson Lister (MS.6962). 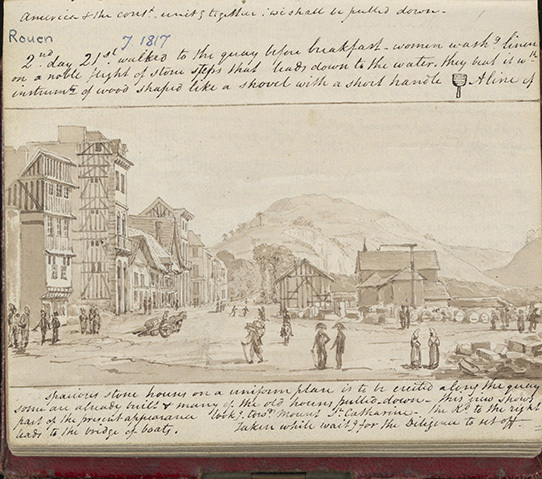 At Dieppe, he sketches the elegant Place d’Armes (again on market day) but also notes, cryptically, that his night in the hotel – whose guests included British people about to embark back across the Channel – was disturbed “by being obliged to overhear a most strange & disgusting example of french humourousness & english profligacy & folly.” We learn no more than this: one suspects, however, that this is somehow connected with France’s long-lasting reputation for ‘naughtiness’ and a degree of sexual licence denied to the 19th century Briton. 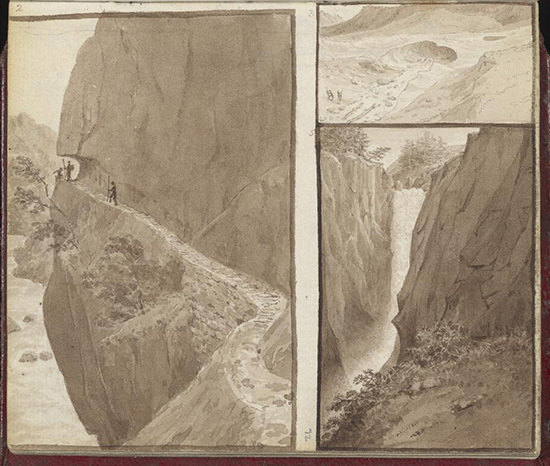 From Dieppe he strikes inland and reaches Rouen: the largest city that he has visited in France so far, this is documented with several pages of description and sketches. France’s defeated status is also to the fore when he arrives in Paris: coming into the city down the Champs-Elysées, he passes “a begun triumphal arch of which only the sides are erected.” The now-familiar Arc de Triomphe was commissioned in 1806 after Napoleon’s victory at Austerlitz, but was incomplete at the time of his fall and would not be finished until the 1830s. Later, Lister will notice that “on the boulevards in the evening, women who are in want but ashamed to expose their distress sing veiled”. He comments no further, but one assumes that women in this position would have been easy prey for sexual exploitation and a drift into prostitution. In Paris Lister’s careful journal breaks down: pencil jottings replace the neat ink narrative of his first days in France, and following his activities becomes harder on the reader’s eyes. It is, however, clear that there was much for him to see. He is in Paris for a fortnight, exploring the historic sights and taking an interest in the living city around him: there are notes on the institute for the deaf that was run by the sign-language pioneer the Abbé Sicard (letters by whom are held elsewhere in the archive, as MS.7612); on the abbatoir at Villejuif; and on many other miscellaneous sights, in addition to the visits to Montmartre and Versailles that one would expect. 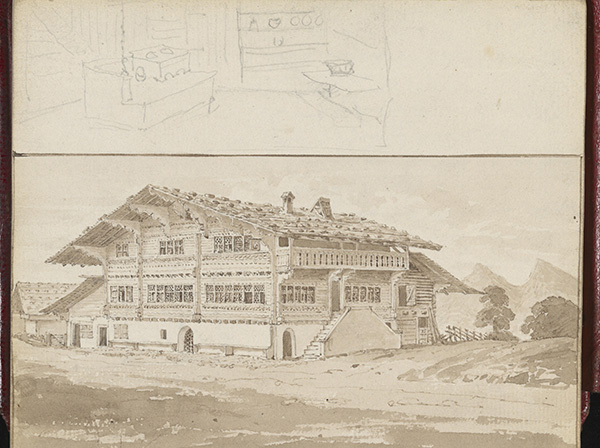 An Alpine chalet, from Lister’s travel journal. His journey back from Switzerland takes him down the Rhine, where he sketches several of the dramatic castles that tower over the gorge downstream of Mainz, then through Brussels: here, he visits the battlefield of Waterloo, whose shadow has hung over much of his journey. 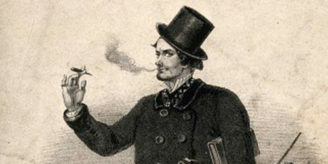 At last, ten weeks after leaving Calais, he is back there, noting that “I look with delight to the thought of ships in England to night even tho I anticipate a severe time of seasickness as the wind is high…” His journey, he notes carefully, has cost him £108 all told: a possible contribution to this careful accounting are the calculations that fill most of the final pages. 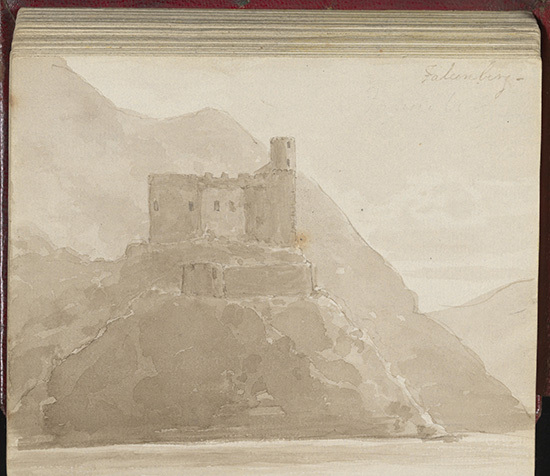 The Falconberg castle, overlooking the Rhine gorge, from Lister’s journal. We do not know if Lister ever travelled so widely again: the following year he got married (to Isabella Harris, a teacher at the Quaker school at Ackworth and daughter of the school superintendent) and before long the first of their six children was on the way, so they may well never again have had the freedom to travel so freely. We can, however, see how travel changed in later years by examining another item from the Wellcome Library’s Lister archive. Joseph Jackson Lister’s son, Joseph Lister – the surgeon and pioneer of antisepsis, one of the most significant figures in nineteenth-century medicine – took his own journey to the Alps as a young man in 1846, a generation after his father, and also wrote an account, held here as MS.6982. The journey to the coast now is by railway and the crossing by steamer: the journey, this time the longer crossing to Ostend, takes half the time of his father’s and is unaffected by the state of the wind. Doubtless to his father’s envy, the younger Lister even notes that “not a body was sick that I know of”. Ostend by now lies in the independent state of Belgium (when the elder Lister passed through Brussels, the area was beginning a brief and unhappy period as the southern extremity of the Kingdom of the Netherlands: a revolution in 1830 brought it independence) and is a seaside resort, men and women together enjoying bathing in the waves; after an afternoon’s exploration and a night’s sleep, the party proceed on their way, once again by rail. In many ways, then, the younger Lister’s journey points us forward to the age of mass tourism that would develop as the nineteenth century progressed, courtesy of the railways and travel agents such as Thomas Cook; his father’s journey is definitely from an earlier age. Both form only a small fraction of the Wellcome Library’s large archive holdings on travel and different parts of the world.